Downloading data, posting analysis results can be done from the information page of each division. While some say that Moore’s Law, a rule of thumb in the field of IT technology that has been playing an important role in development of IT, has been stagnating, it is expected that demand for IoT devices that are able to immediately response to users’ commands will grow amid the arrival of the IoT society. In this trend, industries have been requesting the realization of innovative AI edge computing, a technology that enables handling such response taking AI technologies. Against this backdrop, METI decided to embark on a contest program titled AI Edge Contest aiming to discover outstanding computer technologies, human resources and ideas as well as to encourage promising new human resources to enter these fields for the purpose of establishment of innovative AI edge computing technology. Under this program, entries will use real data and compete in developing solutions to challenges by focusing on future implementations. In the first contest this year, entries will focus on a subject titled “autonomous driving and mobility service,” one of the priority fields that Japan should tackle under the “Connected Industries” policy, and will compete with each other in accuracy of detecting target objects in images for image recognition, a technology indispensable for the realization of autonomous driving technology. METI plans to continuously conduct a series of contests under this program targeting not only algorithms and other software, but also hardware and implementation thereof, as part of its efforts for achievement of innovative AI edge computing technology. The contest will include two divisions: Object Detection and Segmentation. Contestants may only participate in one division. Task Create an algorithm to detect a rectangular region including an object from a vehicle front camera image. Create an algorithm to segment at the pixel level the region corresponding to an object from a vehicle front camera image. * As other benefits, Participation in the Japan Automotive AI Challenge, where algorithms developed by participants will be installed in self-driving go-karts and used in a test-track competition. Up to Four teams, comprising top-placing persons who wish to participate, can take part in the Challenge.Please see the Committe・Other for details. * The idea award is only for report submitters. Also, there may be no applicable persons. In accordance with Article III “Prizes and Rights” of the special regulations established for this contest as described below, participants will either choose to make their own submission data, source code and other relevant items be licensed under an Open Source Initiative approved license (www.opensource.org) or not. This license imposes no restrictions on commercial use for licensed models, source code, and any results attained using said source code. Incidentally, the participants who will not choose this license will not be able to prize winner candidate, even though they can participate in the contest. In regard to posting and/or other publication on any social media site, blog or similar by the participant of information relating to any algorithm developed by said participant or any other materials produced for or related to this contest (including materials used for final submissions and/or final evaluations/inspections), no restrictions apply to posting and/or publication as long as the participant clearly explains that the posted/published items relate to this contest, and absolutely posts the positing and/or publication information (including the link URL to the pages) on the contest forum in order to let all the participants know it. 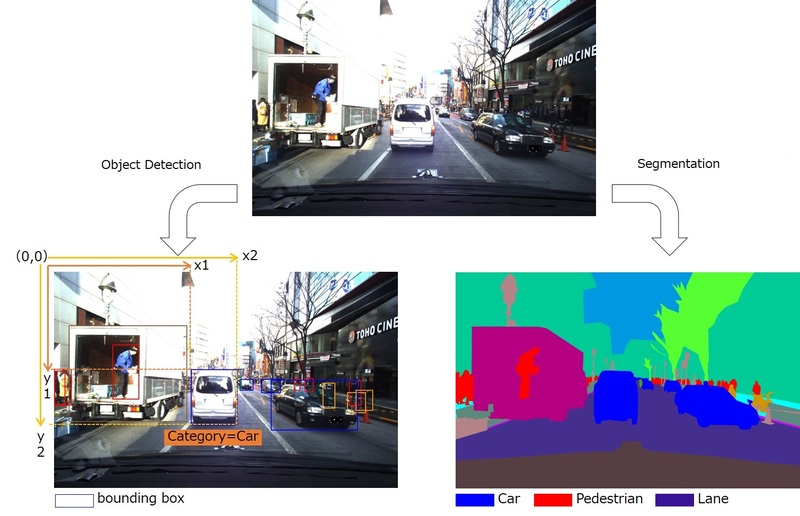 ・Object Detection division evaluators will use the function MAP @ IoU = 0.75, and Segmentation division evaluators will use the Intersection over Union (IoU) method. ・Please visit the individual division's pages for further details. 1.Final scorings and rankings will be determined using correct data sets that differ from those used for the contest. The scoreboard display (ranks and scores) will automatically change from running scores to final evaluation scores once the contest has ended. 2.Regarding evaluation-based rankings, the contestant who applied first for participation in the contest will be ranked higher in the case of an identical (tied) score. 3.The secretariat will contact the winner candidate. The candidate will either choose to make their own submission data, source code and other relevant items be licensed under an Open Source Initiative approved license (www.opensource.org) or not. If you can not grant this license, you will not be eligible to win prize. ・The contestant fails to adhere to participant requirements, rules, etc. 6.We will select winners from those who can confirm the reproducibility. Based on the submitted report, the idea award is decided by the review board. ・Each person is limited to one account only. However, team-based participation is allowed as long as the team uses only one account. (The team will designate a representative from among its members and post analytical results via the account of such representative.) If you are going to join the team, please do the following procedure. 1.All members of the team must sign up to SIGNATE as users. ・You may submit a maximum of 5 entries per day. ・Creating multiple teams or belong to more than one team, increasing the maximum number of submissions and acts such as searching for models is prohibited. ・Privately sharing code or data outside of teams is not permitted. ・However, It's okay to share code if made available to all participants on the forums. ・If it is a method that can verify reproducibility free of charge, we will not restrict the use of pre-trained models, APIs, data other than provided data, etc. ・For example, modification of train data (including manual rewriting of labels etc) is also possible. Module that reads supplied data, carries out preprocessing, and outputs each file in a format that can be input into the model. Divide into files for learning and files for evaluation ("get_train_data" and "get_test_data" or similar), and define a function for preprocessing. Module that reads files created in step 1 to enable model learning. Define a function that can output the learning-complete model, amount of characteristic and cross validation assessment results. Module that reads the test data created in step 1 and model created in step 2 and outputs prediction results in file format. Sponsor： NVIDIA Corporation / Morpho, Inc. / Digital Media Professionals Inc. / DENSO Corporation / SAKURA Internet Inc. / Fixstars Autonomous Technologies / Sompo Japan Nipponkoa Insurance Inc. / NEC Corporation / Sony Corporation / Panasonic Corporation / SoftBank Corp./ Google Japan LLC / Dynamic Map Platform Co., Ltd. / Mitsubishi Electric Corporation / Toshiba Electronic Devices & Storage Corporation / Renesas Electronics Corporation / Tier IV, Inc. / IHS Markit, Ltd. / Toyota Research Institute Advanced Development, Inc.
James Kuffner　CEO of Toyota Research Institute Advanced Development, Inc.
Ambai Mitsuru　Denso IT Laboratory, Inc.
Kohei Ozaki　Recruit Technologies Co., Ltd.
Eisaku Ohbuchi　Digital Media Professionals, Inc.
Jun Kuchii　Accenture Japan Ltd.
Hiroshi Miyata　Fujitsu Laboratories Ltd. 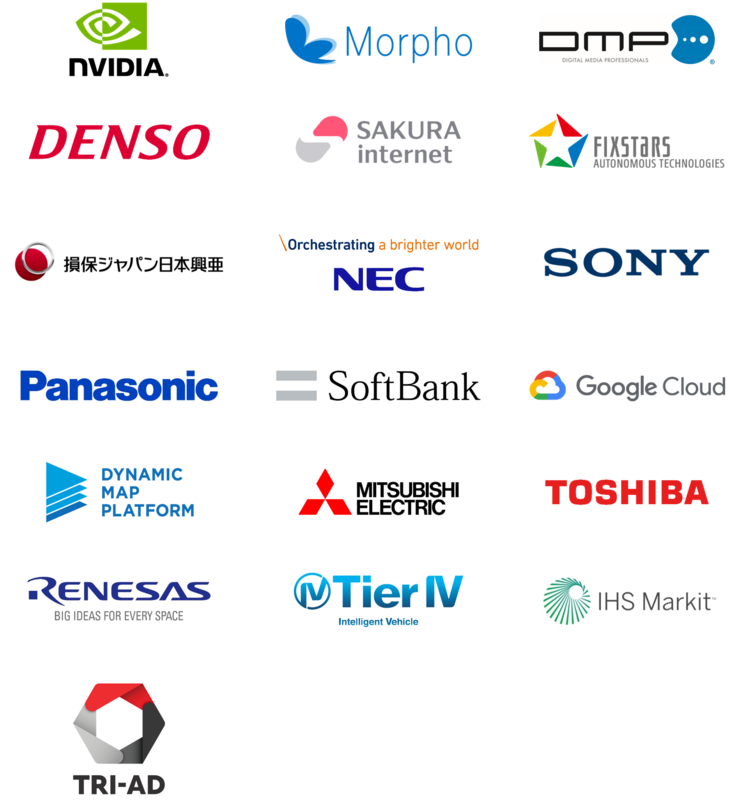 The Japan Automotive AI Challenge, hosted by the Society of Automotive Engineers of Japan, Inc. (JSAE), will be held on March 23,24 2019 at Kashiwa Campus, Tokyo University. AI Edge Contest winners(up to 4 teams) will be held at The University of Tokyo Kashiwa Campus over the weekend on March 23 and 24, 2019. Up to Four teams, comprising top-placing persons from the Object Detection Category and Segmentation Category who wish to take part, will participate in the Challenge. Algorithms developed by contestants will be integrated into self-driving car (autonomous car) programs and, after digital map data creation, sensor adjustments and other preparations are complete, will be put to the test in self-driving go-karts. These vehicles will be run on a test track with various challenges to be completed by the self-driving systems, and rankings will be determined based on vehicle driving performance. Also, from March 16 to 22 2019, we will use the electric cart to race on the Tokyo University of Marine Science and Technology, Echinoshima campus with official training period. Schedule is to be adjusted according to the needs of the team's circumstances. You will license your winning Submission and the source code used to generate the Submission under an Open Source Initiative-approved license (see www.opensource.org) that in no event limits commercial use of such code or model containing or depending on such code. As a reference, we will post a comparison table of representative open source writers.